The 2018 Art and Writing Contest has begun! Information has been sent to the schools but if you or someone you know wants to participate, please encourage your school administrators, teachers, and other students to participate. The top three entries are selected from each school and from those the county level winners for Art and Writing are selected by a panel of judges. 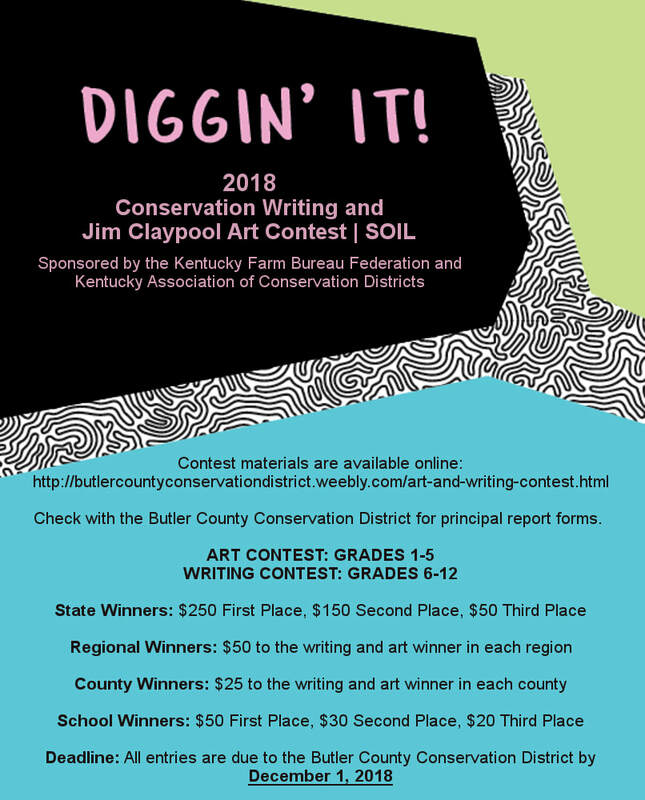 The two county winners for the art and writing contest will each receive an additional $25 from the Kentucky Farm Bureau Federation. Both teachers of both the county art winner and the county writing winner will each receive $50. This year's theme is about SOIL! Click here to view the educational packet that may be used as a reference for entries. Entries and Principal Reports are due to the Conservation District no later than December 1, 2018! Kentucky students grades 6-12 are eligible to compete in the writing contest. Only students through grade 5 may compete in the art contest. A student may not enter both the Jim Claypool Conservation Art Contest and the Conservation Writing Contest during the same contest. An entry must be created by one and only one student. Any entry submitted by more than one student will be disqualified. All entries become the property of the contest sponsors. The decisions of the judges at all levels of competition are final. WRITING: entry may not exceed 1,000 words and must be written in ink or typed on one side of paper only. Typed entries must be written in 12pt font, Times New Roman or Calibri. No photographs or artwork may be included with the written work. It is suggested that the written entry take the form of informational writing (from the perspective of an informed writer to a less informed reader) and may be in the form of a letter, blog entry, editorial or speech. It should persuade the reader to take action toward good soil conservation practices or propose a solution to one or more soil conservation issues. The work should be from the student author and avoid plagiarism from this source or other sources. Sources should be cited. ARTWORK: shall be 8 ½”x11”. Any thickness or color of art board may be used. Art paper may be used, but must be pasted onto art board or cardboard before submitting for competition. NO plywood will be accepted. Artwork may be rendered in any medium: pencil, ink, charcoal, crayon, oil, etc., but it must be flat art. 3-D art is unacceptable; however, collages, photographs or other art pasted onto your board will be accepted as long as it is flat art pasted securely to the poster board. An art entry may take the form of a poster, newspaper advertisement or editorial cartoon, making sure that whatever form is used the artwork conveys a message at a glance that persuades its viewers to take action toward good soil conservation practices. Top three writing entries and/or artworks from your school must be submitted to your local county conservation district by Dec. 1, 2014. The official entry form must be completed and secured to the back of your entry. Keep entry simple and sincere. Be creative and original. Avoid plagiarism by using original words and ideas. Plagiarism is defined as the act of stealing and passing off the words of another as your own without crediting the source. Consider an area of soil that is important to you, your family and your community. Draw from your personal interests or experiences. Writing entry should take the form of informational. Think about soil issues in your community, farm, subdivision or city. DO NOT use the “The Soil Daily Times” as your only source. Interview people in your community about changes in soil issues. Find ways to improve soil in your community. TAKE ACTION!